The return to work after the Christmas break is even more gruelling for rail commuters facing the annual hike in fares. Tens of thousands of commuters face big increases for the 10th successive year. Season ticket holders across the commuter towns of the east will be paying above inflation rises. More then a year after it was announced, Oyster, the magnetic travel card system used throughout London, is being extended to Shenfield and Brentwood. So an annual rail ticket from Shenfield will buck the trend and cost £16 less, at just more than £2,700, from January. Everywhere else sees significant rises. The government has defended the increases, saying it's only right for passengers to pay towards investment in the railways. Therese Coffey, Conservative MP for Suffolk Coastal, said: "We did come back and revisit this and put the price rise back to 1% above inflation, which is what Labour introduced in 2004. "One of the things we have to recognise is that we have to pay for investment as a whole for the railways and we need to fund resources for our own lines. "MPs from all parties, here in the east, are united in pushing for investment and we are continuing to press the Secretary of State to ensure our franchise stays on track." Northamptonshire saw the region's highest increases. Labour's Andy Sawford, MP for Corby, believes the increases are simply unfair. "A cost of a single, off-peak ticket to London from Corby is now £44.50. This is a 6% increase on 2012 prices. All this is happening at a time when real wages are being squeezed. "David Cameron promised he would limit fare rises to 1% above inflation, which should have seen fare rises capped at 4.2 per cent in Northamptonshire." 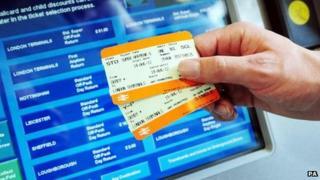 The train operating companies say successive governments have required them to increase average season ticket prices by more than inflation. The government says it has already cut back the latest increase and is determined to reduce the cost of running railways, so it can end the era of above inflation fare rises - something I'm sure we would all welcome.